There are only a few buildings that define an entire nation. The British Parliament building with its Big Ben clock tower is one. The Taj Mahal in India is another. 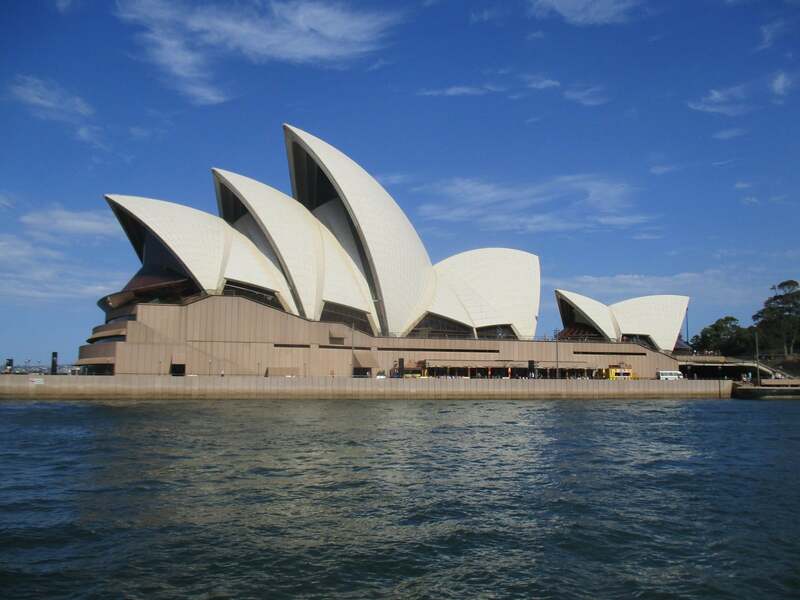 The Sydney Opera House on the shores of Sydney Harbor in Australia is a third. Its soaring roofs are meant to evoke the sails of the ships that brought many of Australia’s original settlers to the Land Down Under. Until World War II, Australia thought of itself as part of the British Empire. It was shocked when the British elected to leave the country largely undefended, demanding that Australian troops be sent to fight to preserve other parts of the empire. When the war ended, Australia was forced to confront the fact that it was not an English country at all but rather a part of Asia. It was hungry to forge its own identity. Little did the people of Sydney suspect that a new opera house adjacent to the harbor would become the symbol of that new identity not only to the citizens of Australia but to the world. The story of the Sydney Opera House began in 1948 when the head of the Sydney Opera called for a new home for the city’s opera company. A request for proposed designs went out to architects around the world. Most of the submissions were dreadful. Some looked like concrete blocks reminiscent of Soviet style architecture. Others resembled military barracks. One was hardly a proposal at all. It was simply a series of sketches scratched out by Danish architect Jørn Utzon. The son of a naval architect in Copenhagen, Utzon was able to conceptualize how his creation would look on the shore of Sydney harbor by imagining it set near Copenhagen overlooking the strait that separates Denmark from Sweden. The Sydney government assembled a panel of 4 internationally renowned architects to choose the final design. One of the panel was famed American architect Eero Saarinen, who was unable to be present when the selection committee first met. The other three architects took one look at Utzon’s submission and immediately rejected it. Later when Saarinen arrived in Sydney, he asked to review all the submissions, including the ones that had been rejected. He took one look at Utzon’s design and declared it his favorite. Sydney was scandalized. The design was unlike anything anyone had ever seen before. It was bold but deemed unbuildable. Utzon failed to provide the engineering drawings that would tell people how to build his vision. But Saarinen’s prestige carried the day and Utzon’s design was declared the winner. Construction didn’t actually begin until 1958. The land where the Opera House was to go was being used as a railroad yard for the Sydney train system. There was a considerable amount of work needed to relocate all the tracks first. When work finally began, people realized they had no idea how to transform Utzon’s vision into reality. Eventually, it was decided the ribs to support the roof shells would be made from precast concrete. Each rib was broken into several sections, which were manufactured on site and then lifted into position by cranes. The ribs were hollow, which allowed steel cables to be place inside to give the completed skeleton the structural strength needed. More steel cables run horizontally between the ribs to hold everything together. Utzon insisted that there be no openings in the roof — no pipes, chimneys, or cooling ducts. Instead, all the mechanical system for heating and cooling were mounted beneath the roof and hidden by the ceiling below. If you know where to look, you can see the subtle openings in the end walls that allow for the entry and exit of air. The roofs themselves are covered in ceramic tiles made to Utzon’s specifications. They appear to be bright white on a sunny day, but are actually two shades of light brown, the color of the cotton sails they are designed to emulate. The tiles are self cleaning, as any dirt or debris is washed away by each passing rain storm. There are no gutters on any of the roof sections. Instead, there are gaps in the concrete slabs that form the walkways around the buildings. Rain water shed by the roofs simply flows through those gaps to a drainage system constructed beneath and empties directly into Sydney harbor. Utzon provided no clues about how to enclose the ends of the multiple shells that compose the various roof sections of the Opera House. The local contractors were left to figure that out on their own. They came up with a combination of steel and glass that resemble the bridge of a ship when viewed from inside. It goes without saying the views of the city and the harbor from within are stunning. An opera house is all about music, of course. There are two main concert venues plus a variety of smaller theaters and presentation spaces. I can attest to the fact that the acoustics in the main hall are exceptional. I bought tickets at the last minute for a piano recital and was seated in one of the last rows, up in what are popularly known as the “nosebleed seats.” Yet I could hear every note the pianist played as if he were seated directly in front of me. Not so for the performers, however. The soaring roof above the main stage creates a small delay before the sound returns to ear level, making it difficult for them to hear their instruments. Keep in mind that the hall was designed 60 years ago. Acoustical engineering has moved on a bit since then. This summer, the interior roof and ceiling will be re-engineered to bring the venue up to current acoustical standards. The Opera House was not completed until 1973. Projected to cost $7 million, it wound up costing over $100 million. Several changes in local government created political headwinds for the project. At times, construction languished as funds ran out, engineers threw up their hands in frustration, and political leaders questioned the wisdom of building the Opera House at all. There is a story that one day, when the future of the Opera House was looking bleak, American opera singer Paul Robeson dropped by the construction site unexpectedly. Standing alone and unaccompanied, Robeson sang opera to the workers for two hours beneath a hot Australian sun. His voice so inspired them that they renewed their commitment to finishing the project. The local government created a special lottery to pay for the construction. Within two years, the local residents bought enough lottery tickets to pay for the completion of Utzon’s creation. There is a postscript to this story. 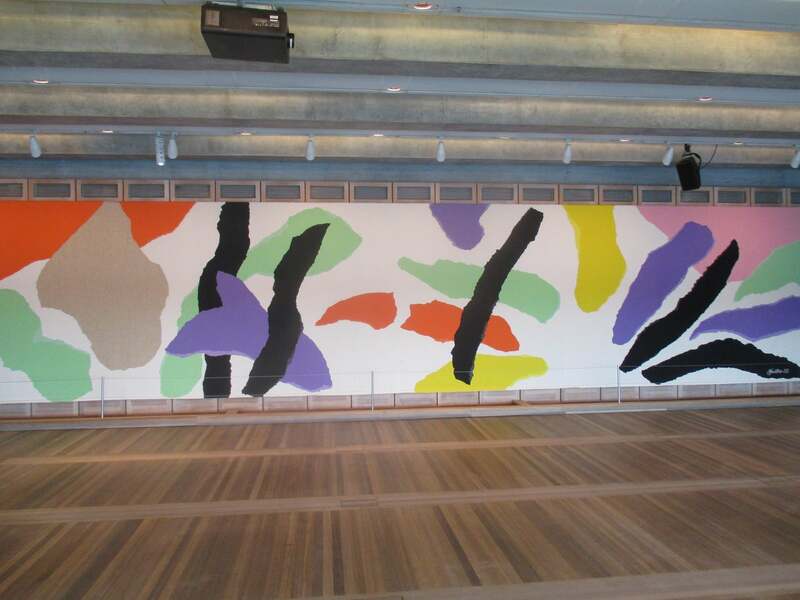 Utzon was a person blessed with the gift of synesthesia, in which a person hears music but also sees it in colors. There is a small presentation room inside the Sydney Opera House that is dedicated to Utzon. On one wall hangs a tapestry made by local Australian artisans from a drawing Utzon himself created. His daughter commissioned the tapestry to honor her father. A photo of it appears below. I like to think it offers insight into the mind of Jørn Utzon, a man who was gifted in so many ways. How fitting that a man who built a temple to music should have such a singular appreciation for the music he helped create. Having visited the Opera House on several occasions and passed by it many times on the ferries that crisscross the harbor, I can attest that this building has an uplifting power unlike any other in my experience. It is an affirmation of the human spirit. Sydney is 15 time zones away from where I live. The journey is arduous even with the all the miracles of modern technology at our disposal. Yet the Sydney Opera House makes the trip worthwhile. It is balm for the soul and a testament to the power of one person’s vision. If you get a chance to see it for yourself, please go. It connects people together in a way that few other structures on earth can do. Photos by the author. Permission to re-use any of them is freely granted provided proper attribution is given.